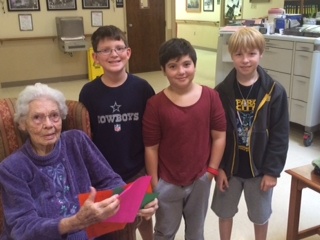 The Hill Country Care Center in Dripping Springs had some fun guests visit on Friday, Dec. 5th. AESA’s Elementary classes with their teachers, Mrs. Hutton and Mrs. Patty, brought lotion and beautiful fleece blankets to the residents. The students assisted the residents with finishing the blankets as well as cheering them up. Thank you, AESA Elementary, for giving to others during the Holiday Season.